The Great Wall Station (simplified Chinese :长城站; traditional Chinese :長城站; pinyin :Chángchéng Zhàn) was the first Chinese research station in Antarctica and opened on 20 February 1985. It lies on the Fildes Peninsula on King George Island, and is about 2.5 kilometres (1.6 mi) from the Chilean Frei Montalva Station, and 960 kilometres (600 mi) from Cape Horn. The station is sited on ice-free rock, about 10 metres (33 ft) above sea level. Simplified Chinese characters are standardized Chinese characters prescribed in the Table of General Standard Chinese Characters for use in mainland China. Along with traditional Chinese characters, they are one of the two standard character sets of the contemporary Chinese written language. The government of the People's Republic of China in mainland China has promoted them for use in printing since the 1950s and 1960s to encourage literacy. They are officially used in the People's Republic of China and Singapore. Traditional Chinese characters are Chinese characters in any character set that does not contain newly created characters or character substitutions performed after 1946. They are most commonly the characters in the standardized character sets of Taiwan, of Hong Kong and Macau, and in the Kangxi Dictionary. The modern shapes of traditional Chinese characters first appeared with the emergence of the clerical script during the Han Dynasty, and have been more or less stable since the 5th century. Hanyu Pinyin, often abbreviated to pinyin, is the official romanization system for Standard Chinese in mainland China and to some extent in Taiwan. It is often used to teach Standard Mandarin Chinese, which is normally written using Chinese characters. The system includes four diacritics denoting tones. Pinyin without tone marks is used to spell Chinese names and words in languages written with the Latin alphabet, and also in certain computer input methods to enter Chinese characters. Guo Kun was a Chinese polar explorer. He led China's first expedition to Antarctica in 1984–1985 and participated in seven antarctic expeditions in total. He led the construction of China's first two antarctic bases, the Great Wall Station in 1985 and the Zhongshan Station in 1989, and served as Director of the Chinese Arctic and Antarctic Administration. Shanghai is one of the four municipalities under the direct administration of the central government of the People's Republic of China, the largest city in China by population, and the second most populous city proper in the world, with a population of 24.18 million as of 2017. It is a global financial centre and transport hub, with the world's busiest container port. Located in the Yangtze River Delta, it sits on the south edge of the estuary of the Yangtze in the middle portion of the East China coast. The municipality borders the provinces of Jiangsu and Zhejiang to the north, south and west, and is bounded to the east by the East China Sea. King George Island is the largest of the South Shetland Islands, lying 120 km off the coast of Antarctica in the Southern Ocean. The island was named after King George III. In summer, the station holds up to 40 people; in winter, 14. The station's No. 1 Building, erected in 1985, lies at the centre of the station and has a total floor area of 175 square metres (1,880 sq ft). It marks the beginning of China’s presence in Antarctica and its Antarctic research program. The Antarctic Treaty and related agreements, collectively known as the Antarctic Treaty System (ATS), regulate international relations with respect to Antarctica, Earth's only continent without a native human population. 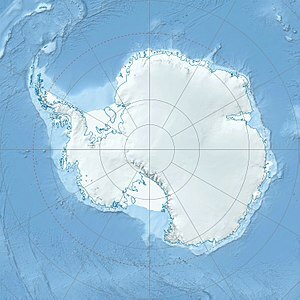 For the purposes of the treaty system, Antarctica is defined as all of the land and ice shelves south of 60°S latitude. The treaty entered into force in 1961 and currently has 53 parties. The treaty sets aside Antarctica as a scientific preserve, establishes freedom of scientific investigation, and bans military activity on the continent. The treaty was the first arms control agreement established during the Cold War. Since September 2004, the Antarctic Treaty Secretariat headquarters has been located in Buenos Aires, Argentina. A Historic Site or Monument (HSM) is a protected location of historic interest on the continent of Antarctica, or on its adjacent islands. The list of historic sites was first drawn up in 1972, and has since expanded to cover 92 sites, with the most recent listed in 2015. Five sites have been removed from the list for various reasons. Many Antarctic research stations support satellite field camps which are, in general, seasonal camps. The type of field camp can vary – some are permanent structures used during the annual Antarctic summer, whereas others are little more than tents used to support short term activities. Field camps are used for many things, from logistics to dedicated scientific research. The Polar Research Institute of China (PRIC) is the main Chinese research institute for the study of the Earth's polar regions. It is based in Shanghai, China. Xue Long is a Chinese icebreaking research vessel. Built in 1993 at Kherson Shipyard in Ukraine, she was converted from an Arctic cargo ship to a polar research and re-supply vessel by Hudong-Zhonghua Shipbuilding of Shanghai by the mid-90s. The vessel was extensively upgraded in 2007 and 2013. Dome A or Dome Argus is the loftiest ice dome on the Antarctic Plateau, located 1,200 kilometres (750 mi) inland. It is thought to be the coldest naturally occurring place on Earth; with temperatures believed to reach −90 °C (−130 °F) to −98 °C (−144 °F). It is the highest ice feature in Antarctica, consisting of an ice dome or eminence of 4,093 metres' elevation above sea level. It is located near the center of East Antarctica, approximately midway between the enormous head of Lambert Glacier and the geographic South Pole, within the Australian claim. Stonington Island is a rocky island lying 1.8 km (1.1 mi) northeast of Neny Island in the eastern part of Marguerite Bay off the west coast of Graham Land, Antarctica. It is 0.75 km (0.47 mi) long from north-west to south-east and 0.37 km (0.23 mi) wide, yielding an area of 20 ha. It was formerly connected by a drifted snow slope to Northeast Glacier on the mainland. Highest elevation is Anemometer Hill which rises to 25 m (82 ft). A number of governments have set up permanent research stations in Antarctica and these bases are widely distributed. Unlike the drifting ice stations set up in the Arctic, the research stations of the Antarctic are constructed either on rock or on ice that is fixed in place. The Mirny Station is a Russian science station located in Queen Mary Land, Antarctica, on the Antarctic coast of the Davis Sea. Law-Racoviță Station is the first Romanian station for research and exploration in Antarctica, named after the Romanian explorer Emil Racoviță and inaugurated on January 13, 2006 at the location of a station constructed in 1986 by Australia and donated to Romania. The station may be found in Princess Elizabeth Land, in the Larsemann Hills, 2 kilometers away from China's Antarctic Zhongshan Station. Teodor Gheorghe Negoiță was a polar region explorer. In 1995 he became the first known Romanian explorer to reach the North Pole. The Arctic Yellow River Station was established by the Polar Research Institute of China in Ny-Ålesund, on Svalbard, in 2003. Zhongshan Station is the second Chinese research station in Antarctica and was opened on February 26, 1989. Kunlun Station is the southernmost of four Chinese research stations in Antarctica. When it is occupied during the summer, it is the second-southernmost research base in Antarctica, behind only the American Amundsen–Scott South Pole Station at the geographical South Pole. When Kunlun is not in operation, the year-round Russian Vostok Station is the second-southernmost base in Antarctica. The Chinese Arctic and Antarctic Administration (CAA) is a Beijing-based agency of the People's Republic of China's State Oceanic Administration (SOA). Established in 1981, it organizes China's scientific program for both the Arctic and Antarctic, and it provides logistic support to Antarctic expeditions. There are several; divisions, including General Affairs, Operation & Logistics, Science Programs, International Cooperation, representation in the Chinese Embassy in Chile, and a Winter Training Base. The director is Qu Tanzhou. A.B. Dobrowolski Polar Station is an inactive Polish polar research station in Antarctica. It is located at the edge of the Algae Lake, Bunger Hills region in the Wilkes Land and was originally constructed by the Soviet Union. It is one of the two Polish stations in Antarctica, the other being the Henryk Arctowski Polish Antarctic Station. Taishan Station is the fourth of four Chinese research stations in Antarctica. Yang Luyu is a former Chinese politician, who served as Mayor of Jinan, Shandong Province. He was dismissed from his position in April 2016 for investigation by the Central Commission for Discipline Inspection. Florica Topârceanu is an Antarctic researcher, best known for her work on Antarctic aquatic viruses and for developing the Antarctic scientific community in Romania. She was the first Romanian woman biologist to study life in Antarctica, and the first Romanian woman expert to the Antarctic Treaty. Liu Yan is a Chinese Antarctic researcher best known for her work on iceberg calving. She is an Associate Professor of geography in the College of Global Change and Earth System Science (GCESS) and Polar Research Institute, Beijing Normal University. Wei Lijie is a Chinese Antarctic researcher, best known for her work on the paleontology and stratigraphy of Tibet and the Antarctic. The Songchenglu railway station is a railway station on Zhengzhou–Kaifeng Intercity Railway. The station is located on the south side of Songcheng Road, Kaifeng, Henan, China. E Dongchen was a Chinese earth scientist and polar explorer, acclaimed as the "father of polar surveying and mapping" in China. He participated in 11 polar expeditions, including the first Chinese expeditions to Antarctica and the North Pole. He was a professor and doctoral advisor at Wuhan University, and was a recipient of the Ho Leung Ho Lee Prize in Earth Sciences. 1 2 3 "南极长城站首任站长逝世 曾发誓"拼命也要建好站"". Xinhua. 2019-04-06. Retrieved 2019-04-13. ↑ Liu Shiyao 刘诗瑶 (2019-04-10). "追记中国首次南极考察队长郭琨：一辈子惦记那片冰原". The Paper. Retrieved 2019-04-13. ↑ "List of Historic Sites and Monuments approved by the ATCM (2012)" (PDF). Antarctic Treaty Secretariat. 2012. Retrieved 2019-04-13. "Chinese expeditioners to reach highest Antarctic icecap". news.xinhuanet.com. 2008-01-08. Archived from the original on 18 January 2008. Retrieved 2008-01-08. "China To Build 3rd Station In Antarctica". Space Daily (www.spacedaily.com). Retrieved 2008-01-06. Wikimedia Commons has media related to Great Wall Station .